Microneedling: Fractional Collagen Induction Therapy. Renew your skin with Fractional Collagen Induction Therapy ! This medical grade treatment not only will improve the skins appearance, but is also used to treat multiple issues that can be seen on the skin. The Rejuvapen™ device utilizes Microneedling, or Fractional Collagen Induction Therapy, as a medical grade, state of the art procedure available through skincare professionals only. This procedure shifts the skin's natural repair mechanism into high gear and starts producing collagen and elastin to repair these micro-perforations. The self-repairing property of the skin is a 100% natural form of skin renewal from the inside out. Your skin becomes firmer and regains its elasticity, fine and wrinkles are visibly reduced, pores become finer, circulation is stimulated and the overall condition of the skin improves. The process is painless, as an anesthetic cream will be applied to the skin prior to the procedure. The hand held device utilizes 9 precisely spaced micro needles in a small cartridge to create invisible, vertical, micro perforations into the epidermis and the top layer of the dermis. It will penetrate through the skin but does not harm it. During the procedure, a serum of 99% growth factors will be applied to the skin, allowing for maximum penetration and results. These growth factors help the skin be firmer, regain elasticity, aid in repairing and stimulating new collagen. Inflammatory Response - Tissue proliferation and growth factors stimulate healthy tissue formation. Tissue Formation - Actual remodeling of skin tissue continues up to 1-year. It does not damage the skin. It leaves the epidermis - the protective layer of our skin - intact. Microneedling is the only skin rejuvenation treatment to target and regulate 3 key skin cells (keratinocyte, melanocyte and fibroblast) without compromising the integrity of the epidermis. Microneedling/CIT stimulates your body's own collagen production in the dermal layer which is where collagen resides and is formed. No foreign substances are injected. The healing period is short (1-2 days). Safe for people with darker skin thus no fear of hyper-pigmentation (dark spots). Effective on peri- and post-menopausal women. Skin does not become sensitive to the sun. Safe for individuals who have had laser resurfacing. Changes may occur in dilated blood vessels that may cause them to disappear. One of the most exciting things about Microneedling is that it can be used on all types of skin and can be used to address a wide range of problems such as acne scars, stretch marks, fine lines and wrinkles. The procedure’s variable needle depth allows for versatility and therefore it can be used on many parts of the body, including the face, neck, décolletagé, arms, hands, legs, abdomen and back. 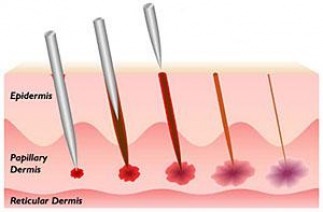 Microneedling allows for individual settings, creating a comfortable experience for our clients. The total healing time depends on the severity of the damaged skin and the depth of repair process required. On average, patients have some slight redness/pinkness (like a mild sunburn) for 24 hours. Many patients notice healthier looking skin immediately. However, the natural repair process of your own skin continues to progress over the course of several weeks. Keep in mind, dermal collagen remodeling takes place over time – it is not realistic to expect damage that has occurred over an extensive period of time to disappear immediately. You may not see the final result until up to 3-6 months following your final session. The number of treatments required will be determined by each individual’s treatment goals and the health of your skin. However, it is recommended for most patients to receive a series of 4 treatments spaced about 4 weeks apart. For patients with deep wrinkles, advanced photo-aging, stretch marks or acne scars it is recommended to receive 6-8 sessions at 4-6 week intervals. We also recommend developing a twice a year maintenance plan to help maintain the glow and rejuvenating effects of your personalized Microneedling treatments. Most patients only experience some slight redness/pinkness (like a mild sunburn) for 24 hours. However, the reaction to treatment depends on the severity of the damaged skin, the depth of repair process required, and how aggressive the treatment is performed. Can I have Microneedling performed on me if I’m pregnant? Typically, patients can resume their normal makeup and skin care regimen 2-3 days following their treatment. Some post procedure make-up can be used immediately post treatment. As this may vary based on the area and type of treatment performed, our Aestheticians will consult with you and give you their recommendation.